With a wealth of knowledge about the poultry and meat industry, our sales staff is here to serve you. Feel free to call, fax or e-mail with any questions you may have. Our friendly and experienced staff is standing by at the ready! 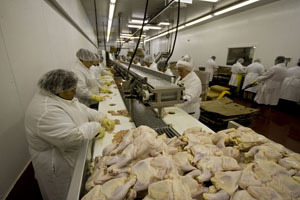 How is your poultry product packaged – fresh or frozen? We offer a variety of methods to pack your order. For fresh product, we can pack your order in plastic bags within a wax-lined box. We would then pack that box with ice on top. We also offer an increasingly popular method of packaging fresh poultry product – gas-flush. This method of packaging involves placing your fresh product in a heat-sealable gas barrier bag. The air is then removed from the bag with a vacuum before a gas, typically carbon dioxide (CO2), is flushed back into the bag, which is then sealed shut. This packaging method allows for a cleaner, drier box, and it extends the shelf-life of the product versus an ice-packed product. For larger fresh orders, we also offer sealed combo bins, which can hold product in excess of 2,000 lbs. within each individual combo. For frozen product, we provide boxes, cases and tray-packed cartons that are each kept in our freezer at temperatures typically below -10° F. We even offer individually quick frozen items as well as individually vacuum-packed products. Whatever your packaging needs might require, Cougle can find a solution for you. Our fleet of refrigerated trucks is ready to deliver your order right to your facility. Customers are also more than welcome to pick up their orders directly from our plant, which is located in the Fulton Market neighborhood of Chicago. Where does your poultry product come from? All of our products originate in the U.S.A. Many of our suppliers are located in the southeastern United States in places such as North Carolina, Georgia, Alabama, Mississippi, Kentucky, and Arkansas. We also source product from farms in Nebraska, Wisconsin, Michigan, Pennsylvania, Maryland and Delaware. What is the age of your chicken when it is killed? Typically, most of the chicken that we purchase from our suppliers reaches an age of between six and eight weeks before it is killed. It then arrives at our plant for further processing one to four days after the kill date. What is the shelf life of poultry? The shelf life is a function of both time and temperature. Therefore, it can vary widely, depending on the particular environmental conditions surrounding the product. Most shelf life exceeds 14 days from the kill date for fresh product and six months from the kill date for frozen product. What is the minimum order size that I may place with Cougle? Our minimum order threshold is 300 lbs. of product for a delivery or $100 worth of product that is to be picked up directly from our plant. Is your facility audited by a third party? In addition to the daily inspections that we receive from the U.S.D.A., Silliker, Inc., the leading internationally-accredited provider of food safety and quality services, audits our physical plant and our Good Manufacturing Practices (GMP) annually. Copies of those audit results are available upon request.